Will you join me today in meditating on some powerful Scripture? Not sure if you have ever had a chance to study the Old Testament prophesy of the birth of our King Jesus--many many many years before the actual event. It puts me in a state of awe to read verses in the Old Testament and see them fulfilled with the life of our Messiah, Jesus. It leaves no doubt in my mind that our God has grand plans and He follows through with them. One such passage of Scripture paints a beautiful picture of the character of Jesus: Isaiah 9:6. I grew up in a very traditional church where the formal choir and orchestra performed Handel's Messiah each Christmas season. There is something to be said for the formality of choir robes, large orchestras and a chorus of singers desiring to lift up the name of Jesus in traditional hymns. It leads me to a more reverent posture as I worship my Lord. I invite you to read this Scripture and take a look at the two videos linked below. Afterword if you don't have the Hallelujah Chorus stuck in your head, I will give you your money back. (wink, wink). ~Wonderful Counselor. This is no end to His wisdom and authority. An authority and power coupled with His WONDERFUL grace, mercy and love. Will you submit to Him as your Wonderful Counselor? ~Almighty God. There is no other besides Him. He is the beginning and end; never changing. Due all of our worship and praise. Will you acknowledge the Lord as your ONE and only Almighty God –– handing over all other people or things that you put on a pedestal above Him? ~Everlasting Father. He desires to be your protector, to cover you with His presence as your daddy. He will never leave you nor forsake you. Will you let Him wrap His mighty arms around today? 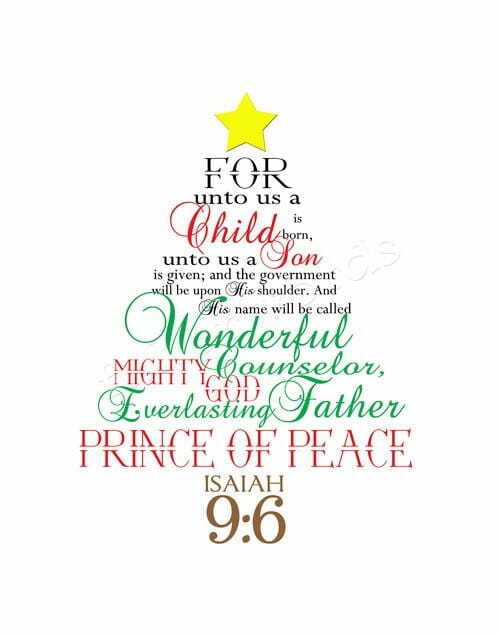 ~Prince of Peace. In a world of uncertainty where we look left and right: wars loom and injustice reigns, our God never relinquishes His control. He is the author and creator of Peace. In His ultimate timing peace will reign and prevail. Until then, will You trust God's plan for His creation? Will you allow Him to pour peace into your daily happenings as your Prince of Peace? This special child born in Bethlehem in a humble stable, was given to US. This special King then died on the cross for each and everyone of US; taking on our sin and pouring out forgiveness. This Lord of Lords then rose from the dead for US; death could not hold Him in the grave because He is more powerful and He is LIFE. We are all welcome to call Him Wonderful Counselor, claim Him as our Almighty God, love Him like an Everlasting Father and be covered in His Princely Peace. It takes claiming just one more name of Jesus over our lives: Savior. It takes us submitting to Him as King as we hand over our sin to Him asking for forgiveness. Have you ever asked Jesus into your heart as your Lord and Savior? He will change your life, your perspective and your eternal path. If you have yet to pray the prayer of salvation –– to pray to ask Jesus into your life –– join me in these words below. If you have prayed this prayer in the past and are living out the Kingship of Christ, I invite you to read this prayer as a memorial of the time when Jesus transformed your heart and took over your life. Father God, I desire to worship You as my Lord and Savior. I desire to hand my life over to You and claim You as my King. Forgive me of my sins, Lord. I accept that You died on the cross for me and I submit to you as my savior. Come into my heart, Lord Jesus. Show me how to love and serve You. In Jesus' Name, Amen. Now go, sing that Hallelujah Chorus all day with joy and reverence in your Heart for the special child that was born unto us that Christmas morning. Read more from Sarah on her blog LIVE IT OUT! or join in on the LIVE IT OUT! Facebook Community.